The Anglican Church was established in Ikom, central Senatorial District of Cross River State in May 1982 through the combined efforts of the present St. Barnabas, Anglican Church, Okuku, now in Yala Local Government Area; and, St. Peter’s Anglican Church, Igoli in Ogoja Local Government area of Cross River State. It was like a little mustard seed that has grown into great tree. Both Churches were then under the Enugu Diocese of the Anglican Communion. The first Anglican Church Service started in Late Sam Okeke’s Driving School Workshop. Later, it moved to Asu-Egbe Primary School in 1982. Not too long after that a parcel of land was acquired at the present site of the Holy Trinity Anglican Church. A Church Building and Planning Committee was then set up with Mr. Samuel Okeke as its first Chairman. The Committee quickly went into action and began to put up the structure for the Church. On 11th July, 1982, the new Church was named Holy Trinity Anglican Church, Ikom. Mr. Fredrick Nwonwa was posted there as the first Church Teacher. The Committee was further enlarged to 19 members. The Ogoja and Ikom Areas did not immediately become part of the Calabar Archdeaconry in Niger Delta Diocese. By God’s divine grace, the three years of controversy between the Anglican Diocese of Enugu and the Anglican Diocese of Calabar, which was created and inaugurated in 1990, came to an end in 1993. All the Churches in Ikom and other parts of the Central Senatorial District of the State were transferred to the newly created Anglican Diocese of Calabar along with others located in Ogoja Local Government Area of the State. 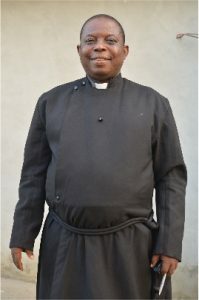 The then Bishop of Calabar Diocese, The Rt. Rev. Dr. W.G. Ekpirikpo, JP (Late) visited Ikom on 23rd January, 1994. Ikom Archdeaconry was created in 1999 with Holy Trinity Church, as the headquarters. Ikom Archdeaconry was therefore the first of the three Archdeaconries so far formally created in Calabar Diocese of the Anglican Communion. The Archdeaconry has continued to grow in scope and in spiritual service. As at today, we have not less than 44 preaching stations and churches in this area extending to Ogoja Road, Bendeghe-Ekiem, Obubra, Ofatura, Yakurr, Ugep etc. St. Timothy Ang. Church Ikom. St. John the Baptist Ratumakun. Anglican Church of Pentecost Ikom. St. Luke Anglican Church Okoroba, Yala nkum. St. Barth. Anglican Church Nde. St. James Anglican church Alok. St. Banabas Anglican Church, Ohana.